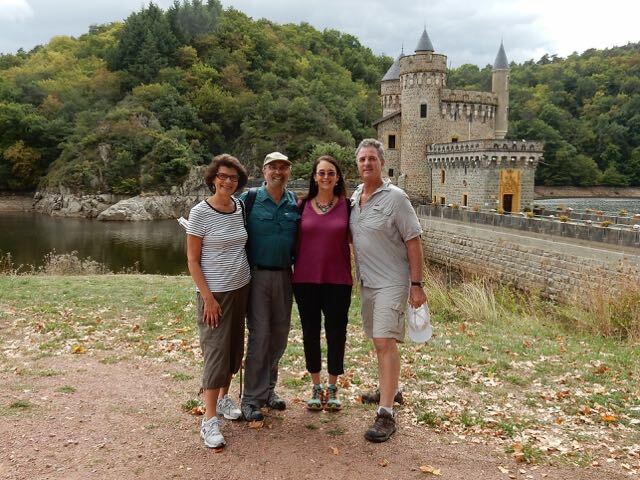 Lisa’s brother and sister-in-law met us in Roanne. This was their sixth time on Rabelo in the five seasons we’ve owned our big girl. In the past, when coming to Rabelo, we’ve always advised our guests to take the train. Unfortunately this year the trains have been on strike. The strike has been intermittent, but we haven’t been able to rely on them. We’ve been telling our friends to rent a car. I never realized the layer of complexity arriving by car would add. Roanne is not that large of a city, and there is only one port, but Jerry and Arlene spent a half hour trying to find us. When they finally did we opened the traditional Rabelo welcoming bottle of champagne along with serving a few, make that a lot of, hor d’oeuvers. 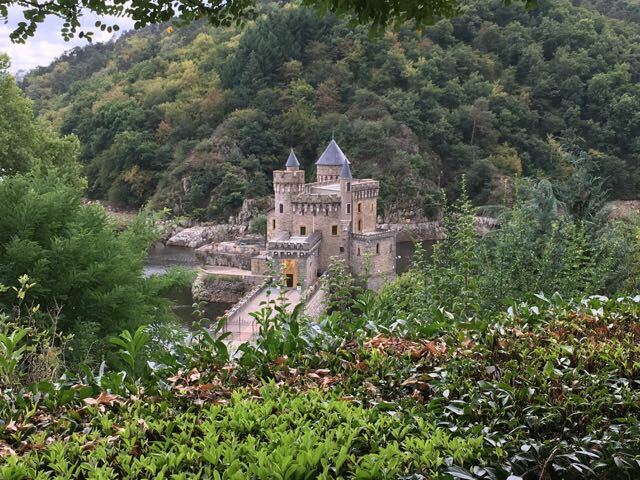 Our first stop was Chateau de la Roche. Lisa and I have been there before. The chateau is the smallest one we have ever visited, but the setting is so unique and special that we just love the place. At one time the chateau stood on a point over looking the Loire River Valley. That was before they built a dam. Now the chateau is surrounded by water except for a narrow access road. 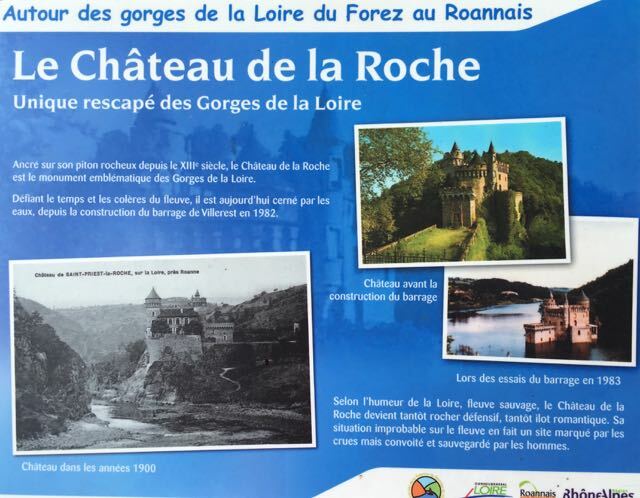 Pictures of Chateau de la Roche before the dam was built. Having a great day at Chateau de la Roche. We departed Roanne even though we should have stayed longer. The nice thing about our life style is that it’s easy to return, which we will no doubt do. 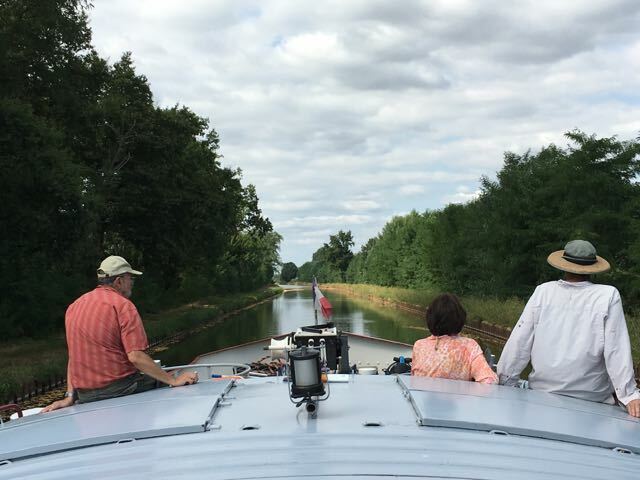 Our next stop was Briennon on the Canal de Roanne a’ Digoin. The canal is beautiful as it runs parallel, for most of its length, with the Loire River. Unfortunately it is also a dead end canal, as you can’t go any further than Roanne. The good news is there’s no commercial traffic on the canal. Unfortunately it’s also the bad news. Because there’s hardly any commercial traffic, the VNF doesn’t spend a lot of money to maintain the canal. 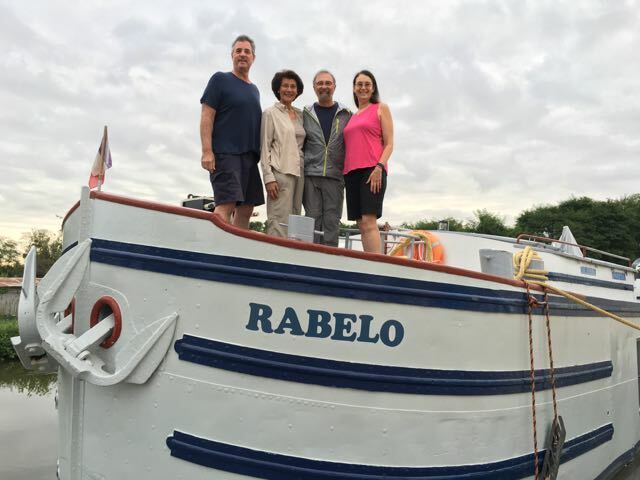 It was a little disconcerting to hear Rabelo rubbing against the sand and gravel on the canal bottom when we were in the center of the channel. If we cut a corner a little too tight we would go aground and have to backup to get out of the shallow water. The Loire River alongside the canal. 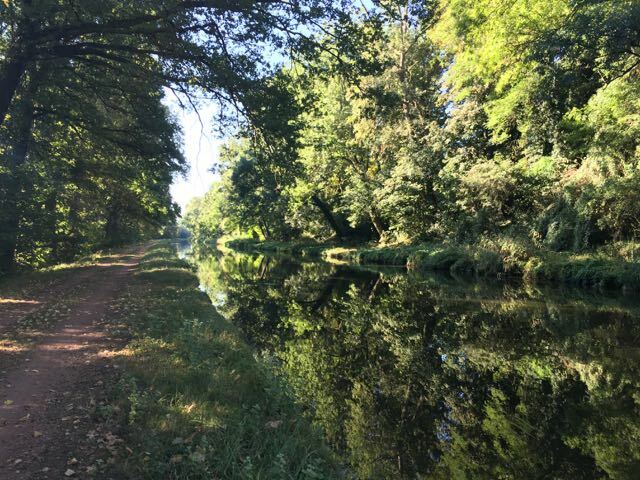 No one ever said the French canals aren’t beautiful. 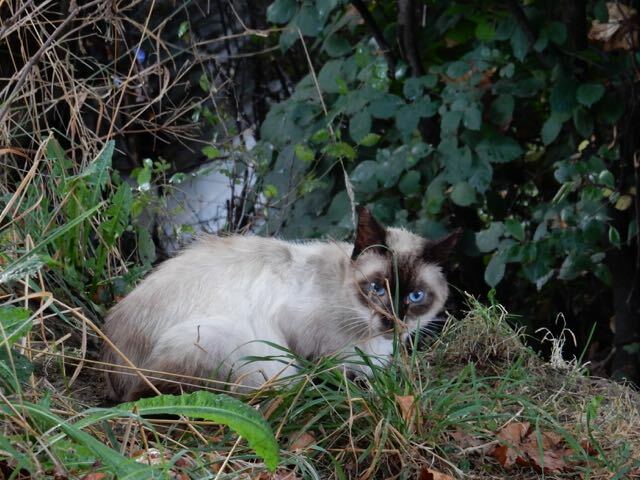 A feral cat looking for lunch. 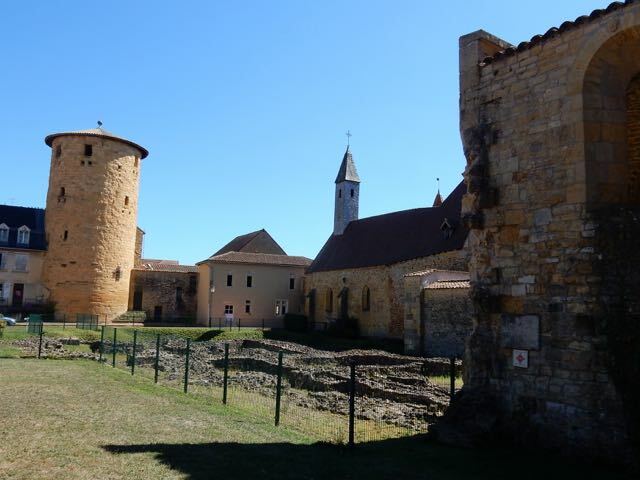 The village of the Marcigny with its Abbaye de Charlieu was a short drive from Briennon. Much of the abbey has been destroyed, but enough remains to still make it interesting. The village dates from the Middle Ages. It’s a little strange walking down a street knowing that it hasn’t changed in hundreds of years, or that dozens of generations have tread along those same streets. 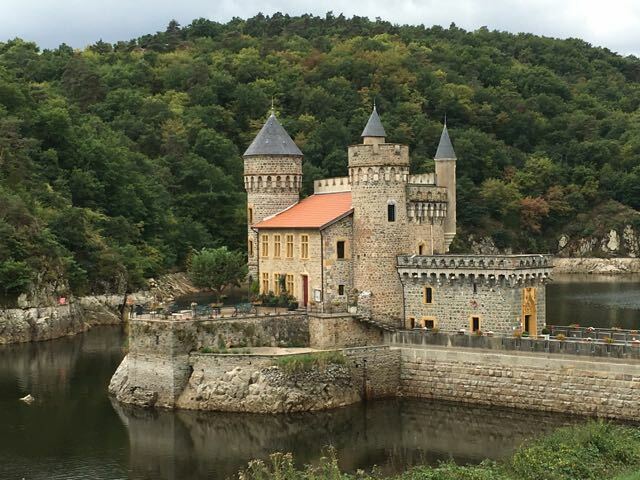 Cruising the canals of France has so much to offer. 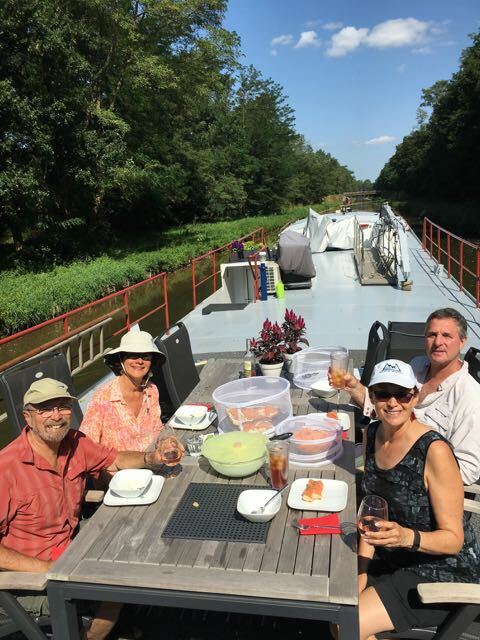 One of the things I enjoy most is having lunch on deck with friends while slowly making our way down the spectacular French canals. There’s something about sitting back and relaxing with a good glass of champagne in your hand. 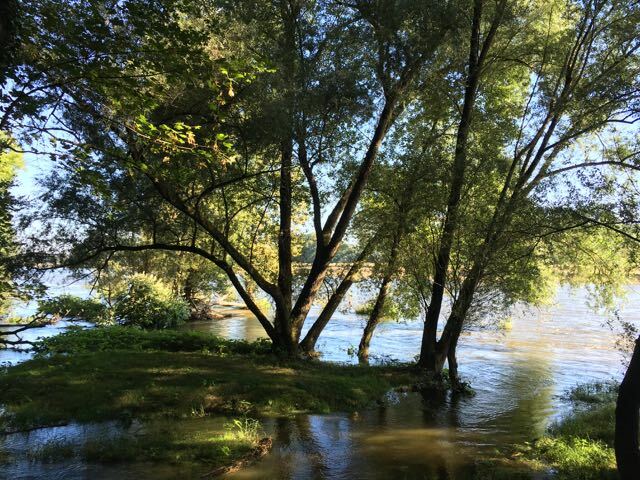 Of course watching verdant green banks, while birds serenade us from the trees, and fish splashing in the tranquil waters that we churn up as we slowly pass doesn’t hurt. Cruising the canals of France. It’s time to say goodbye to Jerry and Arlene. We’re already looking forward to their return.